Each and every year we are doing shows at hundreds of different venues. 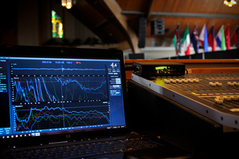 Each show and system configuration requires different system calibration and system tuning. Some venues and systems are set for corporate events, others for live bands, and others for live theater. From this experience, we have extended this service to our clients. Customers that have taken advantage of this service include theaters, houses of worship, amusement parks, restaurants, recording studios and other permanent installed facilities. Nothing can replace experience and a great pair of ears when it comes to calibrating and tuning an audio system. Experience gives one the knowledge and understanding of a system design and what can be expected from a system's performance. There are currently several tools available to aid in system tuning. They can provide deeper understanding and knowledge of how a system is performing. Rational Acoustics SMAART v8. is our tool of choice. We were certified on SMAART software back in 2001 by the software creater Sam Berkow and the late Dr. Don Pearson.